The Fitbit Ionic is the fitness giant’s first true smartwatch product that was released just in time for the tenth anniversary of Fitbit’s first tracker. The Ionic is the company’s most modern device to date, coming equipped with a color LCD display and a wide array of sensors. What’s more, the smartwatch also serves as a launchpad for new Fitbit services like Fitbit OS – the wearable operating system powering the wrist-bound device. The Fitbit Ionic – which only comes in one design – comes boasting a large body made from aerospace-grade aluminum and three physical buttons on the sides, which provide quick access to certain features by either single pressing or long pressing. The smartwatch also has a multi-color LCD touchscreen, but unfortunately the display’s responsiveness isn’t that good, especially when compared to Android Wear alternatives. Design-wise, the Ionic doesn’t impress that much either. It’s a hard-edged, angular smartwatch with chunky bezels that lacks the elegance of products such as the Apple Watch or the Samsung Gear S3. According to Fitbit’s design lead, the wearable was inspired by space, but despite its creator’s intent the smartwatch doesn’t look futuristic or edgy but quite ordinary. The Ionic is offered with interchangeable Classic, Sport or Leather bands. Being a flagship product, Fitbit stuffed the Ionic with all kinds of sensors including a more accurate heart monitor, new SpO2 blood oxygen sensor, GPS, NFC (which lets you take advantage of the company’s own Fitbit Pay tool) and water resistance – just to name a few. The majority of fitness features on this watch are borrowed from other Fitbits, so it will be able to track steps, stairs climbed, calories burned, heart rate, sleep, as well as specific exercise details. Moreover, the wearable bundles an auto-track tool which automatically recognizes and tracks your exercise routine, even if you forgot to press start. The watch also allows you to play music, but there’s a big caveat to be taken into consideration here. You’ll either have to sync files from your computer or access your favorite tracks via a Pandora subscription. The Ionic’s standout feature, however, is battery life. Short lifespan has been the main complaint of users of Android Wear watches, which usually last for about a day, but you won’t have this problem with the Ionic on your wrist. You’ll be able to go as far as 4+ days without popping it in for a recharge. Given that the Ionic’s main strength is the long battery life, you can easily use it to track sleep – and fortunately, the smartwatch is comfortable enough to wear to permit it. Fitbit has improved its previous sleep tracking algorithms so now it can now track light sleep, deep sleep and REM sleep cycles. In the accompanying smartphone app, users will have access to tools such as to Fitbit’s new Sleep Stages app, which break down sleep patterns by analyzing data from the accelerometer and heart rate sensor, as well as Sleep Insights which gives you tips on how to improve your sleeping routine. The advanced sensors inside the Ionic are even said to be able to detect whether you have sleep apnea – a condition characterized by abnormal pauses in breathing and abnormally low breathing during sleep. As mentioned above, the Ionic runs Fitbit’s self-developed operating system called Fitbit OS. Clearly, the company put Pebble’s (a well-known startup which Fitbit acquired in 2016) expertise to good very use. The interface on board is intuitive, so users won’t have a problem finding their way by themselves, although an initial tutorial is available just in case. Like most smartwatches out there, the Fitbit Ionic will show notifications for calls, texts, and different apps from your smartphone. It also offers access to a handful of third-party apps like Starbucks and Strava. Fortunately, Fitbit has a software development kit, so app makers can write apps for the smartwatch. Although it might take a while before they make an appearance. Naturally, Fitbit has bundled the wearable with its own series of health-centric apps like Fitbit Coach – which provides 3 bodyweight workouts on your wrist complete with video tutorials you can watch before getting started. 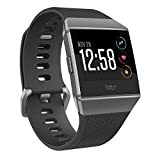 Unlike the Apple Watch which works only with iPhones, the Fitbit Ionic plays nice with all smartphones and it even syncs with Windows PCs and Macs via the Fitbit Connect app. The Fitbit Ionic is available for purchase from Fitbit for $299. Interested parties can also purchase additional straps for the smartwatch for $29.95 and up.